Formatrix was established in the westcountry area of the UK in 1992. Proprietor, Mike Whitfield has worked in imaging for more than 30 years,15 of which were spent running a commercial studio in London's Covent Garden. Mike now specialises in fine art reproduction for artists and photographers offering state of the art scanning, digital capture and printing services. 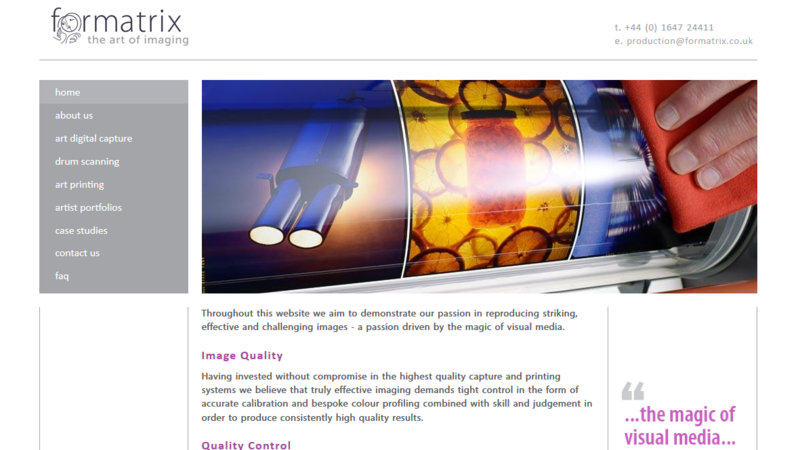 Formatrix came to Cosmic needed a modern website to show off the work they do - Cosmic produced a content management system based website, working with the Formatrix team to identify how the website should portray the business. The website features information on Formatrix's services, as well as artist portfolios, case studies anf FAQs. Take a look at the website by going to formatrix.co.uk.